Whether you realise it or not, on some level, you’re already leading yourself and others. Leadership is something hidden inside all of us. But the key is understanding how to express it. And it all starts with leading oneself. Some of the qualities of a successful leader include adaptability, assertiveness and intelligence. 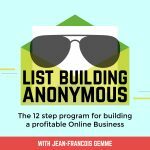 Today’s episode marks the halfway point of Jean’s unique 12 step program showing you exactly how to build a profitable online business. Previous post: Ever hear of cloning your clients?